Steve McClaren has been sacked as Derby County manager for a second time, five months after he was reappointed. Derby, 10th in the Championship, said they acted following a "significant, unexpected and persistent decline in results, team unity and morale". Rams chairman Mel Morris said: "We need a manager who shares our values and who is prepared to develop the team." The club said they expect to make an announcement in relation to McClaren's successor "in the next few days". Assistant manager Chris Powell and technical director Chris Evans have also left. Former England boss McClaren, 55, was reappointed by Derby in October 2016, 17 months after he was sacked. He returned to replace Nigel Pearson, who left by mutual consent after less than five months. Derby lost 3-0 away to second-placed Brighton on Friday and are 10 points off the play-off places. "The Brighton game was so far from what we expect to see from those wearing a Derby County shirt," added Morris. "To ensure we are on the right path, it is important to put the building blocks in place so we can develop a team we can all be proud of." McClaren was in charge for 26 Championship games during his second spell at Derby, winning 12 and losing eight. Derby have won just one of the past nine league games. They first appointed McClaren in September 2013 on a two-and-a-half-year deal after sacking Nigel Clough. His contract was terminated in May 2015 following "a thorough review of the 2014-15 season". In between his spells at Derby, McClaren managed Newcastle between June 2015 and March 2016, when he was sacked. So the Derby players escape responsibility while the manager who has been at the club five months carries the can. 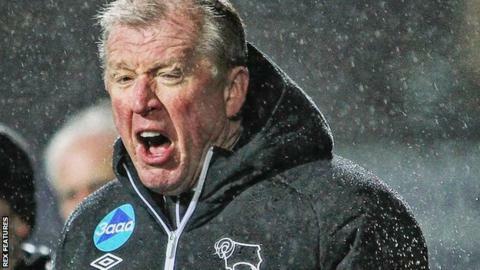 Steve McClaren had an immediate effect last autumn, taking the club out of the bottom four and impressing with his acknowledged coaching skill, but the players shrivelled in the face of promotion expectations. McClaren had set in place a major overhaul of the dressing room this summer, aware that he had been undermined by some malcontents speaking to club owner Mel Morris, a micro-manager who demands success and is not known for his patience - four managers in just over a year testify to that. But it is his club, his £100m-plus investment, and he will run it his way.